Bullis Charter School officials share information on the school’s educational programs with other educators. 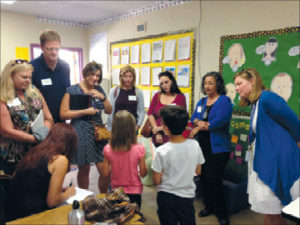 Visitors on a recent tour listen as students discuss what they are doing in class. In an effort to share its model of learning, Bullis Charter School has hosted educators from California, Texas, Japan and China this year. The educators visited Bullis Charter School for a better understanding of how its integrated academic program is put into practice and how they can replicate it at their own schools. The visits highlighted Bullis Charter School’s personalized learning, design thinking, FabLab and MakerSpace. Tours enable teachers, administrators and other education specialists to discuss the curriculum with charter school staff and ask questions. Taisuke Hosokawa, professor at Tokyo Gakugei University, visited Bullis Charter School in the fall to see the FabLab and MakerSpace in action. His 12-person group of professors and graduate students were also interested in how the school’s ethos of global citizenship and emphasis on world languages play out in the classroom. The FabLab, geared toward upper-grade students, houses technologies that teachers integrate in students’ project-based learning units. The MakerSpace, aimed at students in the lower grades, promotes design and assists students in developing prototypes for solutions to real-world problems. Wanny Hersey, founding superintendent of the charter school, said the tours are a larger part of the school’s commitment to innovate and develop new teaching methods and best practices that can be adopted by other schools in locally and globally. Los Altos Hills Mayor John Harpootlian, who recently organized a school tour for local private school administrators, echoed the same sentiment. Bullis Charter School recently hosted an extended stay for four teachers from Chengdu Experimental Primary School and Chengdu Chengfei Primary School – a technology school network in China.